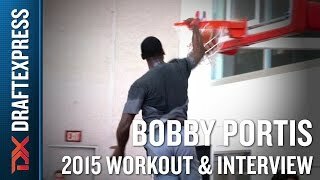 Competing in his second Summer League, Bobby Portis led the Bulls to a perfect 7-0 record and a Summer League Championship. Portis led the Bulls in points and rebounds per game and finished 3rd overall in offensive rebounds, at 3.9 per game behind Jameel Warney and Alan Williams. Portis, who is known for his physical play around the rim and constant energy on the glass, continued to show that he is more than just a hustle player. He shot just 30% on 52 attempts from 3 last year, but made 10-24 from deep in Vegas and looked comfortable spacing the floor or playing out of the pick and pop. The second year pro out of Arkansas also showed glimpses of an impressive face up and back to the basket game, hitting some tough fade away jumpers. He is not an elite athlete, but he is a quick jumper and makes up for whatever lack of athletic ability he has with effort. Portis already carved out a valuable bench role for the Bulls last season, and his role will presumably increase given his development and the departures of Joakim Noah and Pau Gasol. -Competitive kid. Not afraid of contact. Rock solid big man at high school level. Will be a contributor from day one at Arkansas. Extent of his upside remains to be seen.